Britannia’s Marie Gold, a 60+ year old favourite of homemakers and 3rd largest biscuit brand in India is on a quest to fulfil women’s aspirations of embarking on an Entrepreneurial journey and finding financial independence. The first-of-its-kind advocacy initiative, which coincides with Britannia’s Centenary year, runs through January, and will reward ten homemakers with INR 10 lakhs to start their businesses. The brand has also put together an expert panel of mentors who will hand hold the neo-entrepreneurs and guide them to attain success in their business ventures. 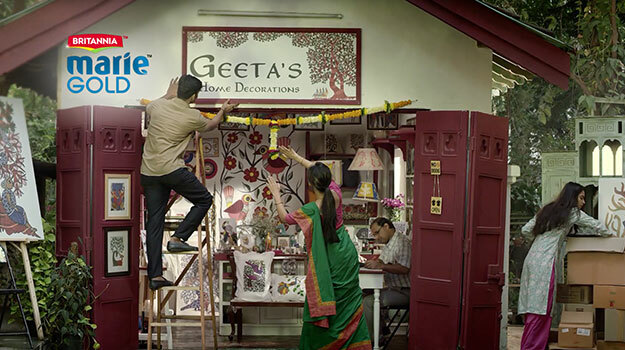 To kick off the campaign, Britannia has released a promotional TVC with Lowe Lintas and a long form digital film in collaboration with JWT. Homemakers are constantly caught up in the daily responsibilities of looking after family and all too often, their own ambitions and dreams fall by the wayside. The new generation of homemakers are not satisfied playing backstage – they seek to ensure that their personal interests do not take a back seat as they go about her usual responsibilities. In the film, the brand portrays a contemporary Indian Homemaker who strives to ‘Do More, Be More’ by going beyond her family duties. While happily looking after the well-being of her family, she dreams of her potential of starting a business. Britannia Marie Gold champions such Homemakers who have the ability to find reserves within them to ‘Do More and Be More’. Production house: Radhika Produces Films, Director: Mr. Vijay Prabakaran.